Holiday villa is situated in the small village Okrouhlá 3 km from Milevsko and 10 km from the Orlík lake in a nice countryside alluring to cycling and walking. At the object there is a nice fenced garden 800 m2 with garden sitting, fire and swimming pool 3,6 m which provides you nice refreshment in summer days. There are three bedrooms in the object, built-up area 150 m2. Prices for the whole object and week. 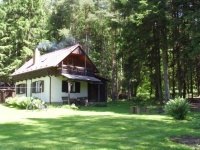 The beautiful cottage is located 10 km north of České Budějovice and 3 km from Hluboká nad Vltavou at the end of the village Dobřejovice. The village is surrounded by pine and mixed forests adjacent to a deer park Hluboká. The house was completely refurbished in 1997 and is the highest located house in the village, so it offers a view of surroundings. There is a garden with a circular pool with a diameter of 3.5 m. Built-up area of 90 m2. New holiday house is situated in a quiet part of the village Frymburk and offers comfortable accommodation near the Lipno lake. In summer the surroundings is ideal for cycling, in-line skating, swimming and water sports, in winter there are ski slopes in Lipno nad Vltavou (10 km) or in Austria (Sternstein, Hochficht). You can visit Wellness Hotel Frymburk (100 m from the house) which offers a wide range of services (sauna world, water park, wellness and spa treatments, table tennis, squash, volleyball, bowling, etc.). The former lodge is a large stylish building located in a hamlet 1 km under the top of the mountain called Kohout. The staying in this unique place is in term of the capacity suitable especially for bigger groups or friendly families. The object is built in a large hectare piece of land which neighbours directly on a forest and cyclotracks. You will be surrounded by beautiful countryside and clean woods while the lodge will provide you nice rear for your staying. Except for a living part there is also a large common room with a fireplace situated in an adjecent building across the court, in a barn you can find a table tennis. In the fenced piece of land there is also a covered pergola with sitting and grill and a swimming pool 10x6 m.
Possibility of weekend stayings in low season! The chalet is located in a hamlet at a forest between the villages Dubovice and Vlásenice cca 3 km west of Pelhřimov. 1 km long field path goes to the object. Guests have the possibility of 2 bikes hire right from the owner for a fee and take advantage of many cyclotracks and hiking trails located in surroundings. At the object there is an unfenced garden 500 m?, a sand pit, a swing. On request we provide you a table tennis and badminton. Built-up area 70 m?. Nice cottage with a swimming pool is located in a remote area in a small village in the PLA Děkanská Skaliny in the Novohradské mountains, 8 km from Kaplice. The cottage offers a spacious lounge with fireplace and kitchen, three bedrooms and a partially fenced garden with outdoor seating, barbecue and above ground swimming pool. This quiet place assures guests a peaceful holiday, but also many activities in the picturesque countryside of the Novohradské mountains (hiking, biking, swimming etc.). The nearest possibility of swimming is 600 m from the cottage - Soběnovská dam, which is also suitable for fishing (trout water, carp). It is possible to inhabit the cottage in winter, the nearest ski resort - Kramolín 30 km or skiing in Austria (Sternstein). Built-up area is 80 sqm. Newly built recreational house is located in a large fenced garden on the edge of the bath village Vráž near Zvíkov 10 km from Písek. Near surroudings are suitable for walking or cycling, the whole area is a renowned mashroom and fishing paradise. In the village there is a bath open to public where it is possible to order healing, relaxation and beautifying procedures. At the object there is a large fenced garden 3.300 m? with garden sitting, fireplace, barbecue and garden shower. In the garden there is also small house and sand pit not only for small ladies available. For fans of cycling there are 4 bikes for rent. Tent Tee-pee could be set up on request. Ground floor 70 m?. Nice holiday chalet is located in a known holiday area at the river Lužnice between the towns Soběslav and Planá nad Lužnicí. The object is situated 50 m from the river so it is the ideal place for fishermen (possibility of a rowing boat hire). 300 m from the object the sandy lakes with the possibility of quality swimming begin. Almost flat landscape of local countryside just challenges to cycling (bikes hire in the camp 600 m). At the object there is a fenced garden 650 m? with nice sitting under the pergola, garden swing, garden fireplace and swimming pool 5,5 m.
Nice country cottage provides ideal rear both for the rest stayings of families with children and those, who decided to get to know the beauties of the Bohemian Forest and surroundings on bike or foot. It is situated on the edge of a small and quiet village Rohozno (7 km from Klatovy). 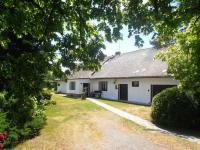 There is a fenced piece of land 1.400 m2 with a swimming pool (3,6 m), table tennis and grass fives ground. For kids there are toys, swings or a sand pit. You can visit the town Klatovy (7 km), the castles Švihov (15 km), Rabí (12 km) or Velhartice (30 km), the lakes Černé, Čertovo, Laka, the look-out Poledník and many other interesting destinations. New holiday chalet is located right on the bank of the pond on the edge of a small village Hatín near Jindřichův Hradec. The object is just like made for all who want to spend quiet holiday in the immediate vicinity of the water with the possibility of swimming and also like to get to know the area around Třeboň and Jindřichův Hradec on bikes or by car. At the object there is a fenced piece of land (from one side with a green fence) 350 m2 with garden sitting and fire. Nice sitting can be also enjoyed on the terrace, the entrance on which is from the common room. Swimming right at the house from own piece of land! In low season weekend and shorter stays for advantageous prices are possible.